Serves 6 as a side dish for brunch, lunch, or dinner! + Preheat oven to 425F. Butter the bottom of an oven-proof baking dish with 1 Tbsp of the butter; melt the remainder. Arrange the slices in the dish in rows or concentrically, dot with small pieces of the remaining butter. Sprinkle with sugar, mace and salt, bake 30-45 minutes, depending on how caramelized you want them to be. Allow dish to sit for 10 minutes or so before serving – melted sugar can cause severe burns. Plantains have great heat retention, so they will still be nice and hot. *Plantains and ripeness – green plantains are best sliced thin and used for chips, or boiled and mashed like a potato. 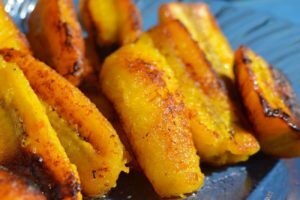 Medium ripe plantains are best baked, fried or grilled, they are slightly sweet and quite starchy, and will be golden yellow with black streaks. Very ripe plantains are best for baking and beer, and are soft and black all over.